Cummins, Inc. (CMI) recently hit a new all-time high just shy of $85 after rebounding from a key trend line in late August. With an average earnings surprise of 73% over the last four quarters, this Zacks #1 rank stocks has some solid upward momentum. Cummins, Inc. designs manufactures and services diesel and natural gas engines, electric power generation systems and engine component products worldwide. The company was founded in 1919 and has a market cap of $16 billion. Our most recent look at Cummins came in late July when the company reported better than expected Q2 results that marked the highest earnings-to-revenue ration in 25 years. Revenue for the period was up 32% from last year $2.43 billion. Earnings also came in strong at $1.25, 40% ahead of the Zacks Consensus Estimate. Cummins now has an average earnings surprise of 73% over the last four quarters. The company’s Engine and Components segments drove the strong results, with each reporting 45% sales gains from last year. Cummins also saw strong results on the international front, with sales in emerging markets like China and Brazil driving much of its segment growth. Cummins emerged from the quarter with a stronger balance sheet, with cash and equivalents up $390 million from last year to $924 million. Debt did jump a bit however, climbing $76 million to $756 million for a debt-to-equity level of 16%, in line with its peers. Estimates took a big jump on the good quarter, with the current year adding $1.11 to $4.98. The next-year estimate is up $1.03 in the same time to $6.43, a bullish 29% growth projection. With a forward P/E of 16.5X, CMI trades in line with the industry average of 16X. CMI recently hit a new all-time high of $84.69 after rebounding from a key trend line that has been in play since early July. The MACD below the chart is bullish too, recently spiking higher along with shares. 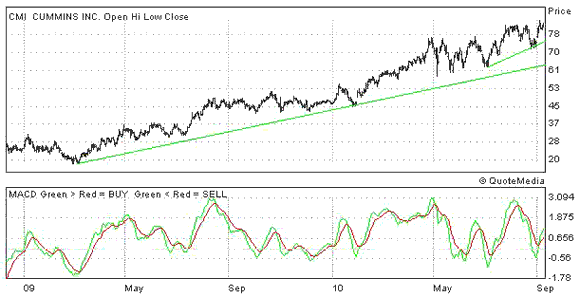 Look for support from the long and short-term trend lines on any weakness, take a look below.